Yesterday, I got one of these mails from a customer that make you think “Ehm, no”. Can you please enable the TPM on all VMs. The short answer is “Ehm, no!”. But I’m a kind guy, so I added some explanation to my answer. Let’s add some context around this topic. The Trusted Platform Module (TPM) is a cryptoprocessor that offers various functions. For example, BitLocker uses the TPM to protect encryption keys. But there are another pretty interesting Windows features that require a TPM: “Virtualization-based Security“, or VBS. In contrast to BitLocker, VBS might be a feature that you want to use inside a VM. 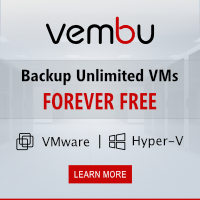 VBS, uses virtualization features to create an isolated and secure region of memory, that is separated from the normal operating system. VBS is required if you want to use Windows Defender Credential Guard, which protects secrets like NTLM password hashes or Kerberos ticket-granting tickets against block pass-the-hash or pass-the-ticket (PtH) attacks. VBS is also required when you want to use Windows Defender Exploit Guard, or Windows Defender Application Control. Credential Guard, Exploit Guard, and Application Control require a TPM 2.0 (and some other stuff, like UEFI, and some CPU extensions). So, just add the vTPM module to a VM and you are ready to go? Ehm… no. And now things might get complicated… or expensive… or both. Why do you need VM encryption when you want to add a vTPM? The TPM can be used to securly store encryption keys. So the vTPM must offer a similar feature. In case of the vTPM, the data is written to the “Non-Volatile Secure Storage” of the VM. This is the .nvram file in the VM directory. To protect this data, the .nvram file is encrypted using the vSphere VM Encryption feature. In addition to the .nvram file, parts of the VMX file, the swap file, the vmware.log, and some other files are also encrypted. 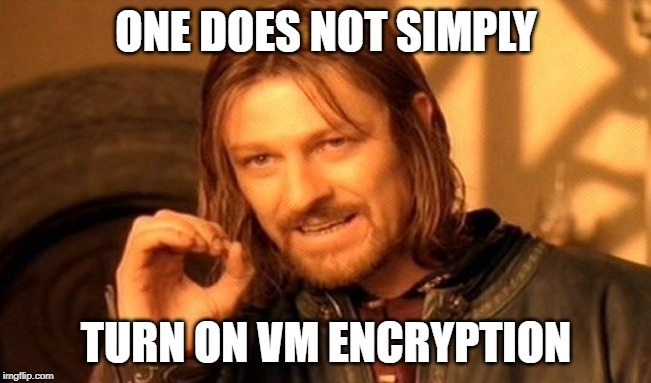 But not the VMDKs, except you decide to encrypt them. The KMS is not a part of the vCenter or of the PSC. It is a seperate solution you have to buy. The KMS must support KMIP 1.1. Take a look into the Key Management Server (KMS) compatibility documentation offered by VMware for supported KMS products. Make sure that you think about administrator permissions, role-based access control (RBAC), or disaster recovery. When you have to deal with security, you don’t want to have users use a general, high priviedge administrator account. And think about disaster recovery! You won’t be able to start encrypted VMs, until you have re-established trust between your vCenter and your KMS (cluster). So be prepared, and do not implement a single KMS. And this is why vTPM is nothing you simply enable on all VMs. Because it’s security. And security has to be done right. Mike Foley has written two awesome blog posts about this topic. Make sure that you read them. 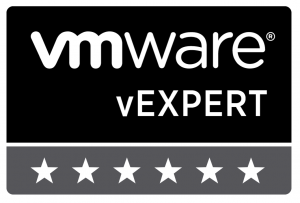 This entry was posted in Security, Virtualization and tagged security, vExpert, vmware, windows on April 4, 2019 by Patrick Terlisten.